As the Catholic Church prepares to canonize Pope John XXIII and Pope John Paul II, CatholicPhilly.com presents insights into the lives of the two holy men who will be declared saints Sunday, April 27 at the Vatican. 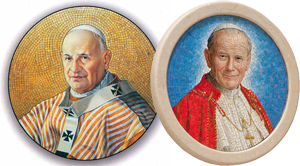 See our complete package of biographical information, the recollection of a Philadelphia priest, assessments of the saintly popes’ legacies, plus photos and more. The Mass and festivities will be broadcast in English live at Salt + Light Media beginning 3:30 a.m. Eastern time on Sunday, and repeated at 9 a.m. and 10 p.m., and at 2 a.m. April 28 (all times Eastern). See more from Salt + Light here.